Select: Option12 Year Blue12 Year Green15 Year Blue (+ $280)15 Year Green (+ $280) This item is out of temporarily out of stock. Contact us for shipping date. SUPERIOR STRENGTH – Super Mesh’s fabric is made from very tough strands, making it stronger than standard mesh material and better able to withstand heavy snow loads and extreme wind. Rugged stainless steel dual springs provide added strength and will not become “sprung” under the weight of snow and ice. TIGHTER WEAVE – Super Mesh’s tightly woven fabric provides two levels of protection. Since this tight weave provides almost total shade, the sun’s algae producing rays do not enter the water, leaving your pool virtually algae-free in the spring. This super tight weave allows water to seep through the cover, but filters out all but the finest debris. Since almost not dirt or debris gets into your pool, spring opening is quicker, easier and requires fewer chemicals. LIGHTWEIGHT – All this protection in a lightweight cover that is easy to install and remove! Plus, increased U.V. 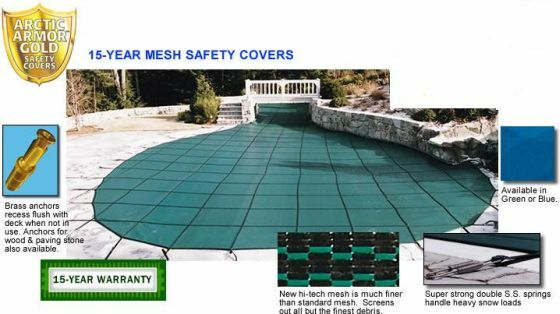 stabilizers embedded in Super Mesh keep your cover like-new, even after many years of harsh sunlight.